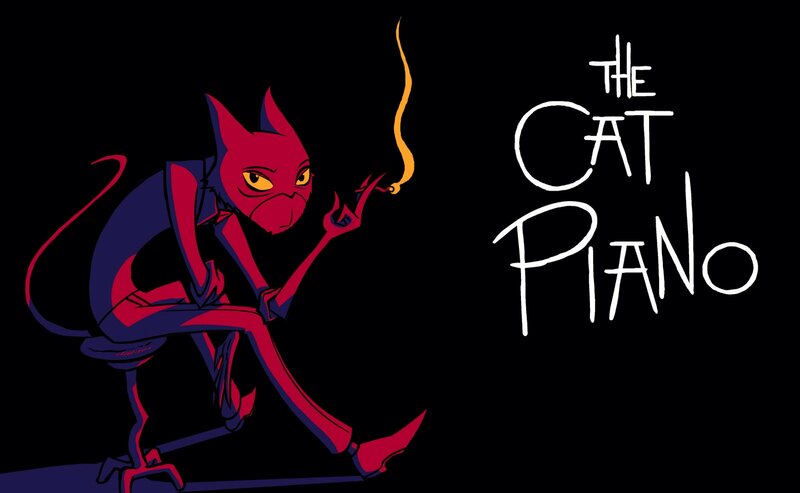 Welcome to the making of THE CAT PIANO a short animated film by Eddie White and Ari Gibson of The People’s Republic Of Animation. You may have seen some of The PRA’s past animated films CARNIVORE REFLUX (2006) and SWEET & SOUR (2007). Here we will give you a glimpse at the making of our latest film. You will see how the idea evolves and eventually becomes a living, breathing piece of animation. 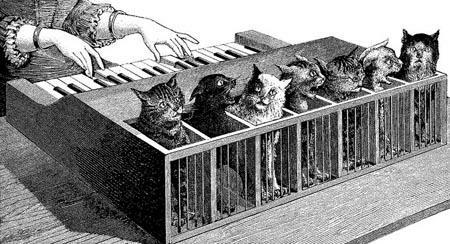 THE CAT PIANO began as poem in the style of beat poets such as Jack Kerouac mixed with the romantic poems of Edgar Allen Poe. The subject matter was inspired by an old instrument that actually existed in the 17th century called The Cat Piano. It was an incredibly cruel instrument that poked a different cat’s tail with each key struck. It was for the twisted entertainment of a decadent German Prince and dubbed KATZENKLAVIER in Germany. This horrific instrument has been forever banished from music history. I’m Eddie White and I am the writer of the poem. I am Creative Director at The PRA. I co-directed CARNIVORE REFLUX with James Calvert and then directed SWEET & SOUR. I’ll be designing and co-directing this short. I’m not a cat lover nor a cat-hater. Hey people, I’m Ari and I’ll be the animator, designer and co-director of this short. I am the Art Director here at the PRA and, do actually really like cats. Due to the lack of budget and limited team (the two of us) we knew this film had to be short, sharp and have a bold visual style to match the subject matter. To this end this short will be entirely 2D animation utlising traditional animation techniques. The films aesthetic is inspired by vintage jazz albums covers, art-deco posters, the photography of Brassai, Bruce Timm’s Batman: The Animated Series and japanese anime, namely that of Kazuhiko Kato, Osamu Tezuka and Hiroshi Masumura. There’s also a strong film noir flavour. We look forward to your company and comments throughout this journey. Same Cat Time. Same Cat Channel.